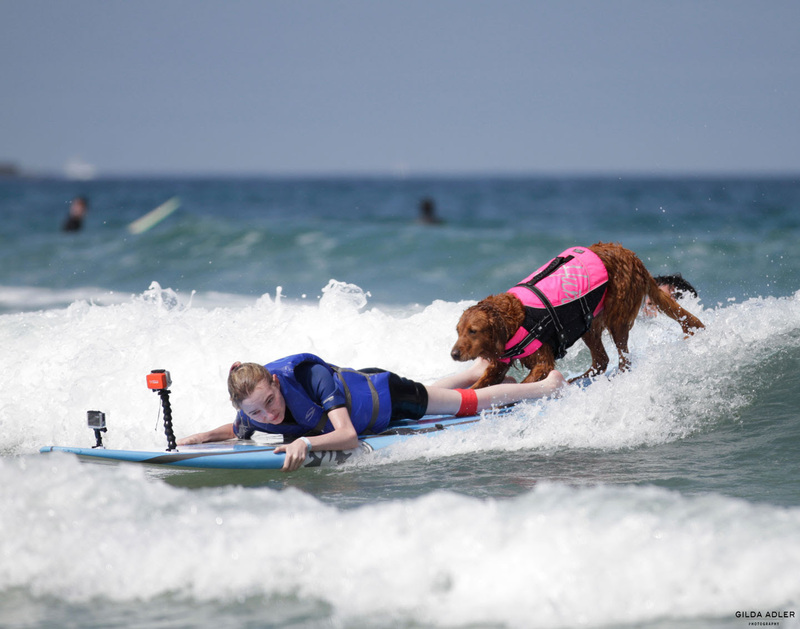 SURF DOG RICOCHET MAKES DREAM COME TRUE FOR TWO TEENAGE SISTERS WITH SAME TERMINAL ILLNESS WHO WANTED TO SURF WITH HER! Last Wednesday, Ricochet surfed with 17 year old Savannah and 19 year old Bellamy Arterburn from Denver, Colorado. They both have the same terminal illness, Friedreich’s ataxia, a debilitating and degenerative neuro-muscular disorder with no treatment or cure. 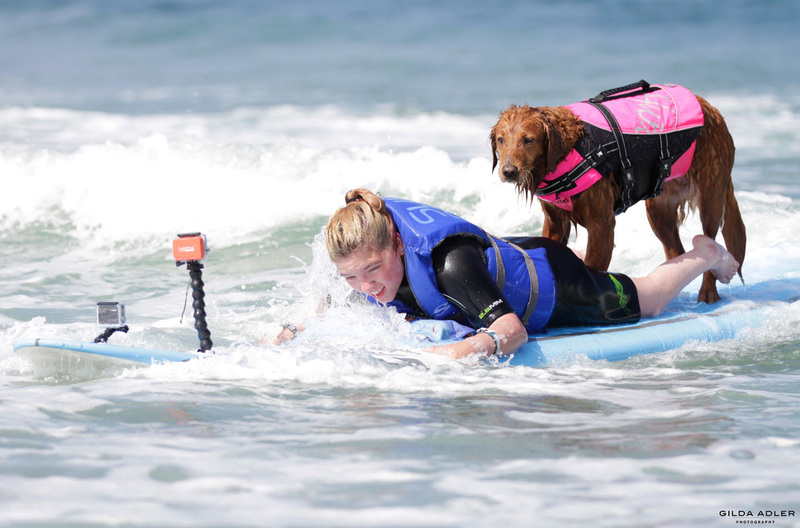 They traveled to San Diego to catch some waves with their favorite canine, as well as experience her paws-on healing. 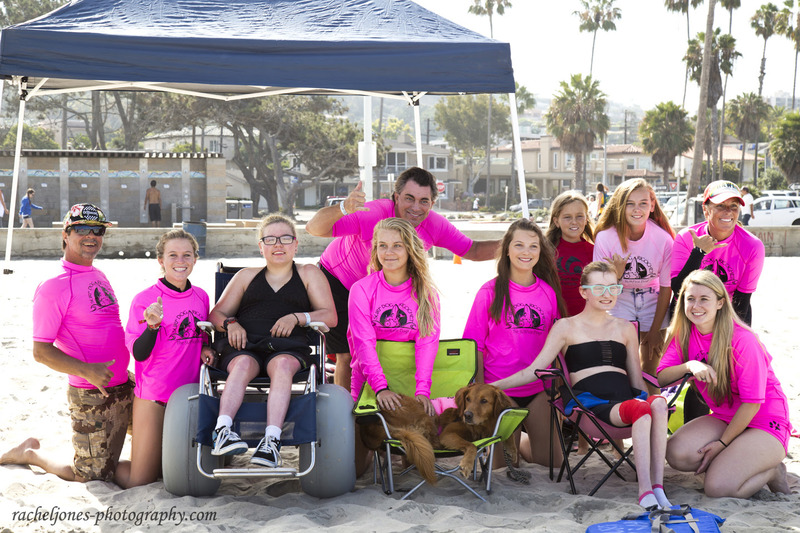 Ricochet’s water handler, Dave came up with the idea of Ricochet hosting a fundraiser to bring the girls to San Diego. Within 24 hours, the whole trip was funded! Ricochet’s Facebook fans, Scott and Sharon Brandstadt donated 100,000 Southwest Airline miles. Hotel Indigo, Del Mar donated a room. 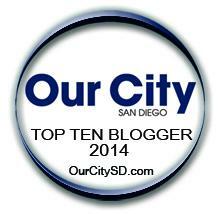 Ricochet’s Facebook, Twitter and Instagram fans sent in cash donations to cover attractions, activities and dining. 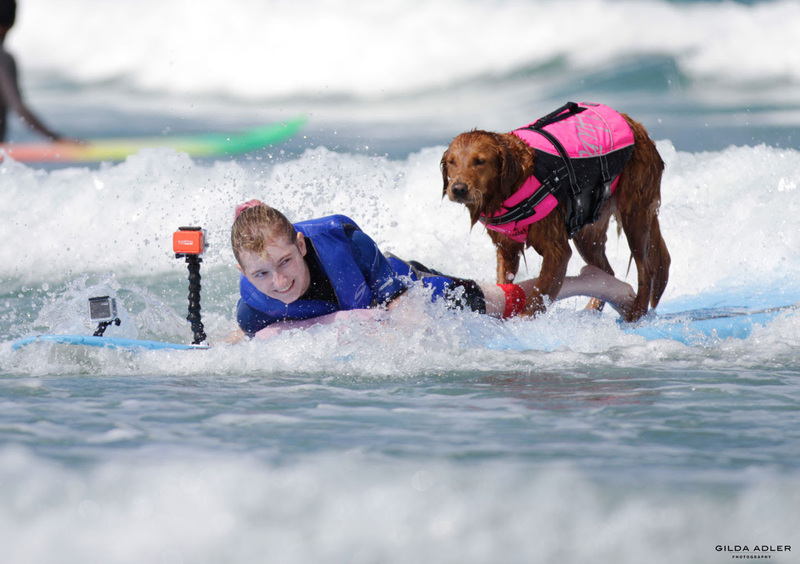 In fact, 9 year old West, who has autism wanted to pay it forward from a surf session he had with Ricochet a few months prior. Having a child with special needs helping other kids with disabilities made it an even more magical occasion. 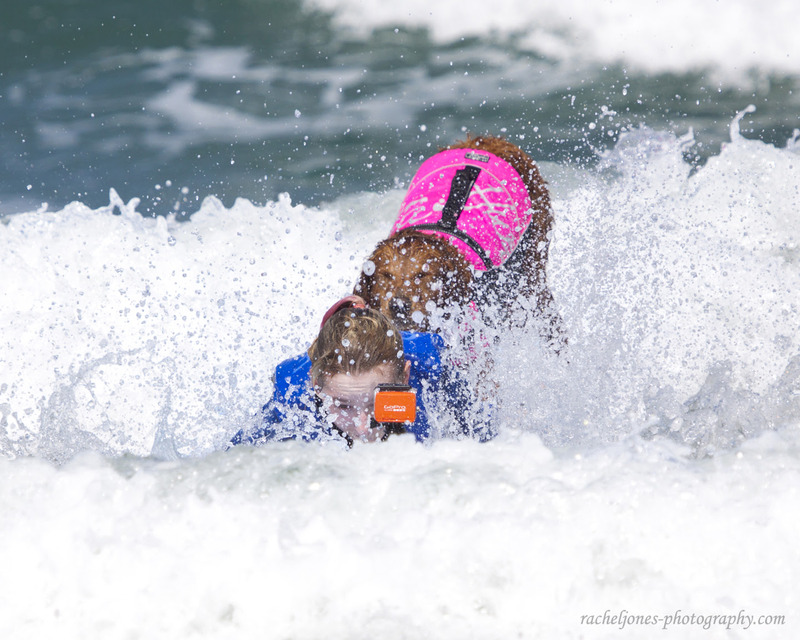 This was the first time the girls ever surfed, so safety was the first priority. It was made possible by the experienced and skilled water team. 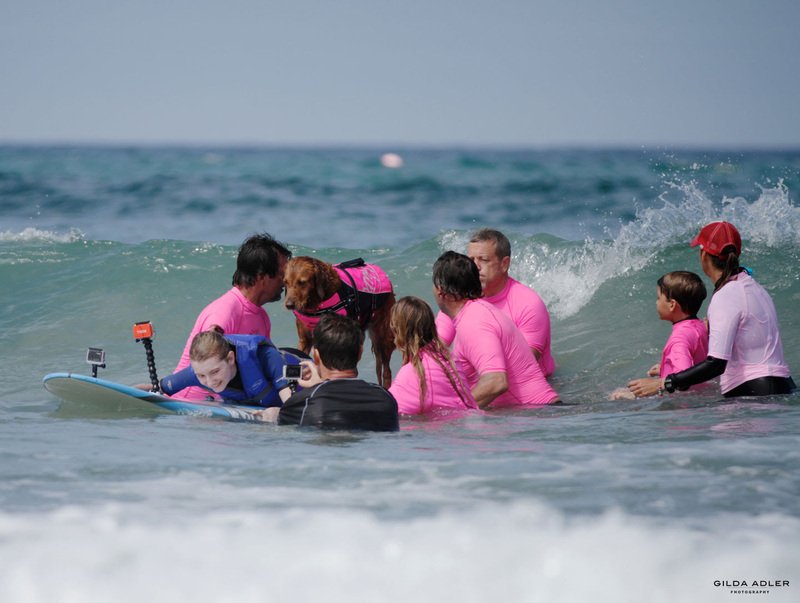 Then, Donovan took his turn surfing with Ricochet and stood up on his very first wave. It was the first time in a long time this single dad could leave his worries behind for a few moments. 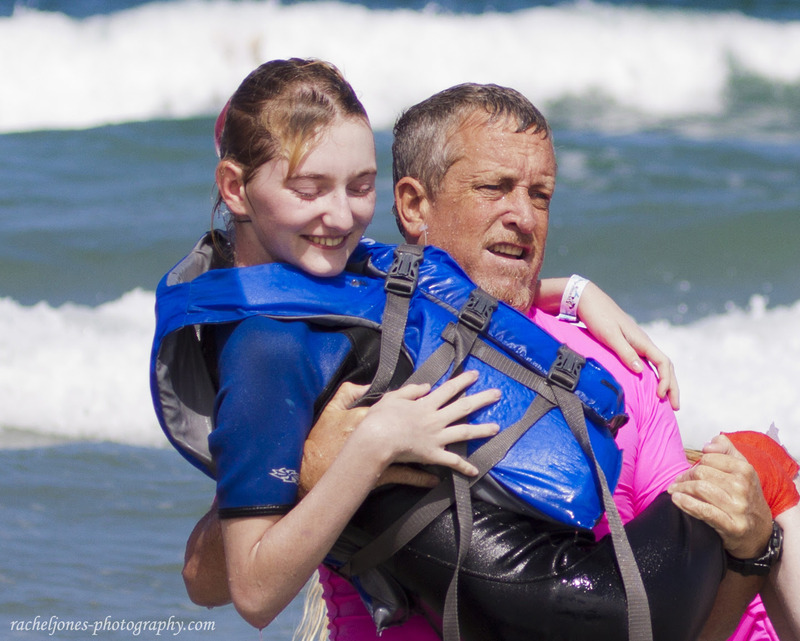 Their smiles, screams and laughter were filled with exhilaration. 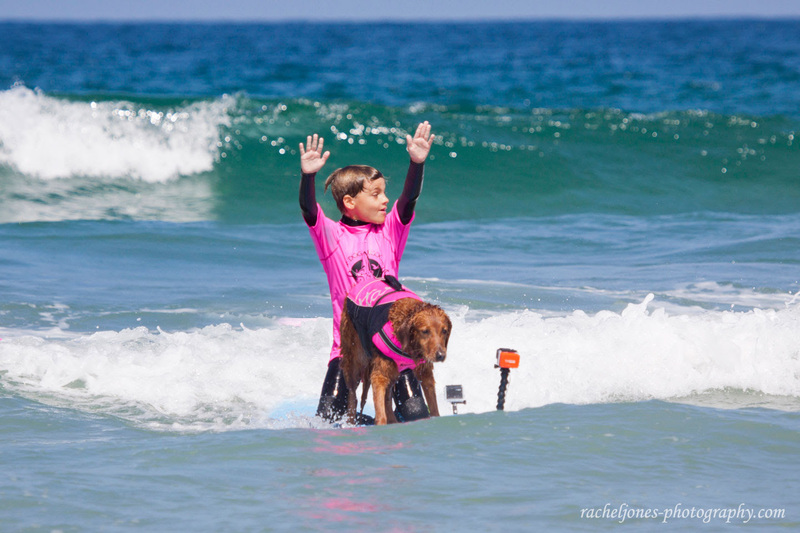 “I’ve always wanted to surf and then I found out about Ricochet and it made it more special. It just felt so good, like I was free”, Bellamy said. Savannah fell in the water once, and exclaimed “that was so cool. It was actually really exciting”. 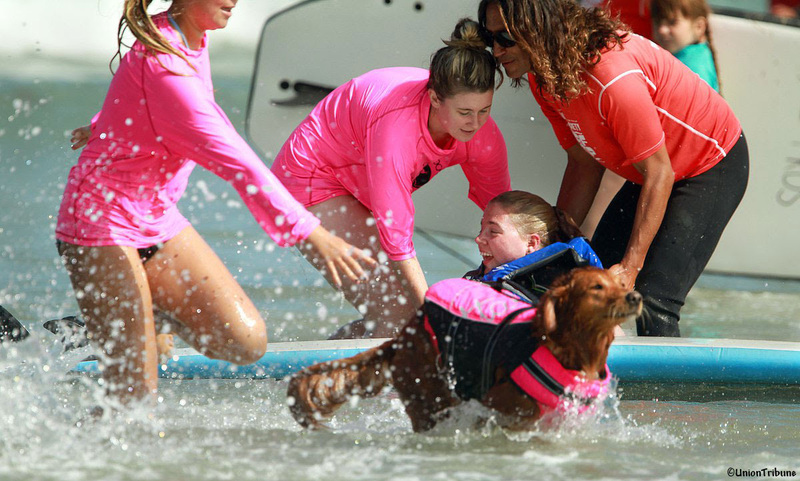 Bellamy and Savannah said they felt a sense of empowerment, and also experienced Ricochet’s paws-on healing. 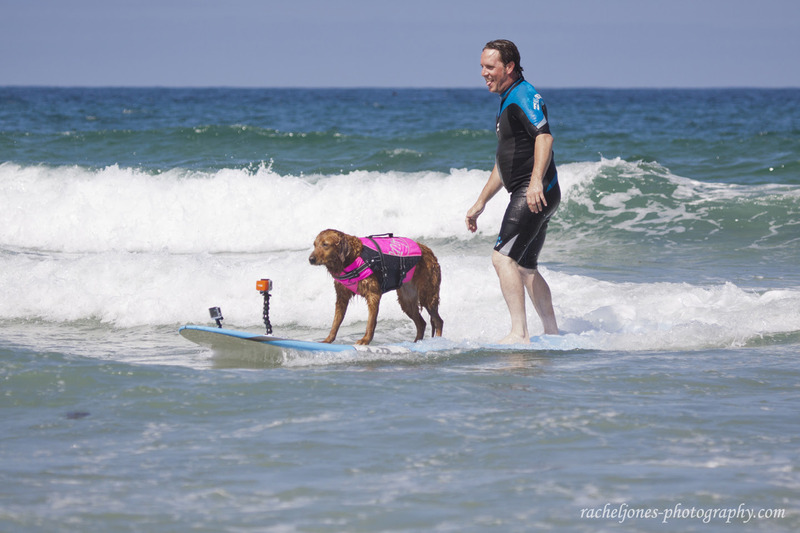 This surf session was the epitome of the healing power of the ocean… and the healing power of a dog! Although surfing has been at the forefront of Ricochet’s work, it’s not the act of surfing that makes her interactions so life changing. 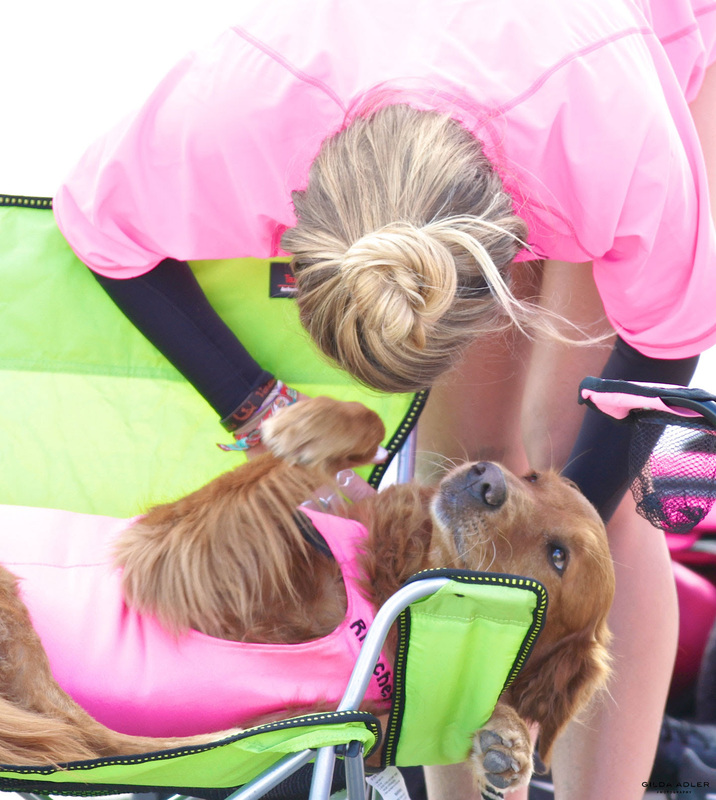 It’s her powerful paws-on ability to make immediate, deep, heart-to-heart connections with the individuals she interacts with. She intuitively and empathically alerts to their emotional and physical changes, and then provides support and healing energy where it’s most needed. 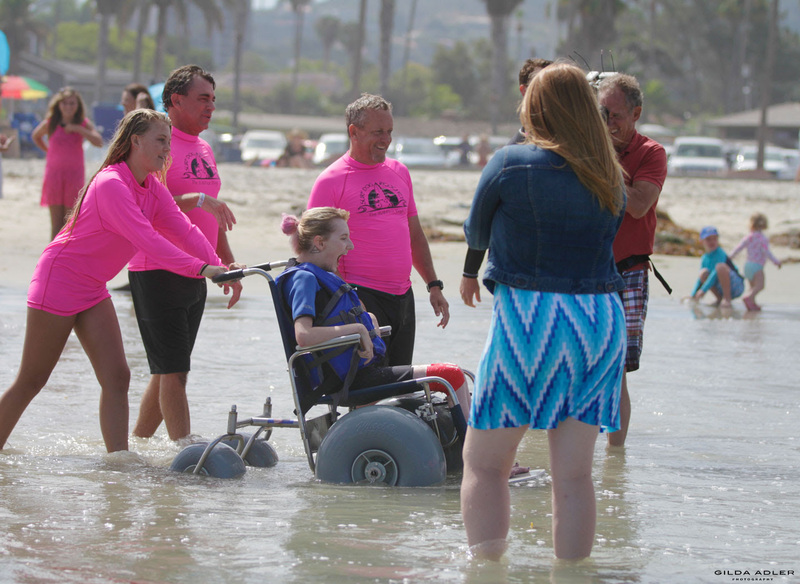 Ricochet was honored to make Bellamy and Savannah’s dream come true while raising awareness of Friedreich’s ataxia. 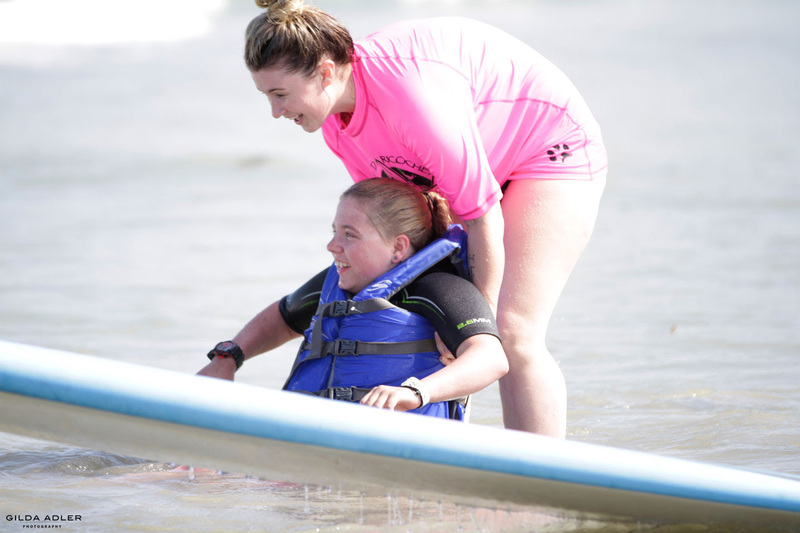 Now, we ask you to please get on board and join her by sharing this inspirational story of two sisters loving life in the face of adversity. 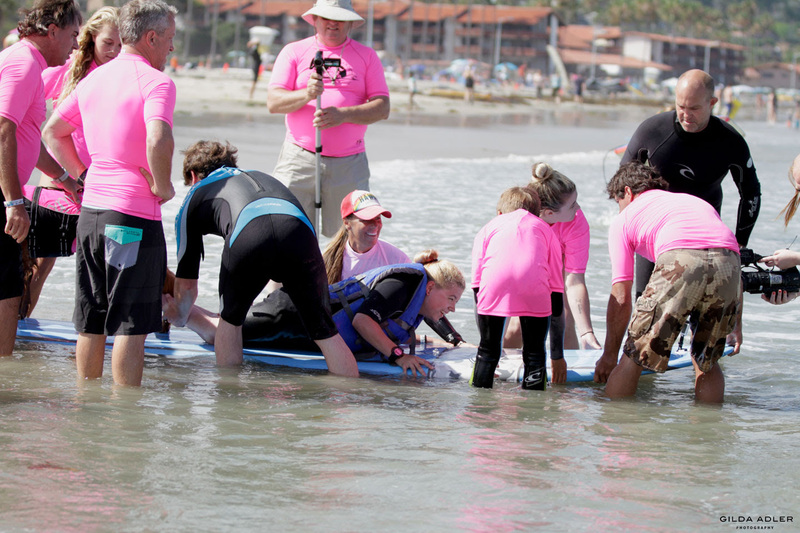 And be sure to watch the videos of their memorable surf session below!